In 1983, the world lost one of its weirdest frogs. 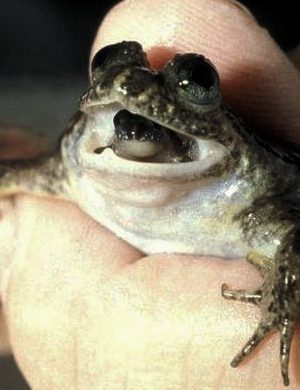 The gastric-brooding frog, native to tiny portions of Queensland, Australia, gave birth through its mouth, the only frog to do so (in fact, very few other animals in the entire animal kingdom do this–it’s mostly this frog and a few fish). It succumbed to extinction due to mostly non-human-related causes–parasites, loss of habitat, invasive weeds, a particular kind of fungus. There were two subspecies, the northern and souther gastric-brooding frog, and they both became extinct in the mid-80s sometime. Except–what if they didn’t? Taking place at the University of Newcastle, the quest to revive the gastric-brooding frog became known as the Lazarus Project. Using somatic-cell nuclear transfer (SCNT), a method for cloning, the project has achieved the major step forward of creating an early embryo of the extinct frog. Essentially, they found a related frog–the great barred frog, which also lives in Queensland and has cool eye markings, like it’s wearing sunglasses–deactivated its eggs, and replaced them with eggs taken from the extinct frog. Even though the gastric-brooding frog has been extinct for decades, it’s possible to do this because individual specimens were kept preserved in, believe it or not, everyday deep freezers. When going through somatic-cell nuclear transfer, the eggs began to divide and form into the early embryo stage. The embryos didn’t survive much longer than that, but it was confirmed that these embryos contain genetic information from the gastric-brooding frog–that yes, in fact, they have brought it back to life. The researchers are confident that this is a “technical, not biological” problem at this stage to breed gastric-brooding frogs to adulthood. This is a big step forward for the worldwide attempts to revive extinct animals–the Lazarus Project researchers will soon meet with those working to revive the woolly mammoth, dodo, and other extinct beasties to share what they’ve learned. Oh, and in case you were wondering: the gastric-brooding frog lays eggs, which are coated in a substance called prostaglandin. This substance causes the frog to stop producing gastric acid in its stomach, thus making the frog’s stomach a very nice place for eggs to be. So the frog swallows the eggs, incubates them in her gut, and when they hatch, the baby frogs crawl out her mouth. How delightfully weird! Twin sisters who claim to be Amsterdam’s oldest prostitutes have retired after more than 50 years each in the business. Louise and Martine Fokkens, 70, have decided they are too old after bedding a total of 355,000 men. Mum-of-four Louise, says arthritis now makes some sexual positions “too painful”. And Martine, who has three children, admits she finds it hard to attract punters – though one elderly man still has his weekly sadomasochism session. A family from Sardinia, Italy have set a new world record for longevity, taking the title for the highest combined age for nine living siblings. The three brothers and six sisters from the Melis family had a collective age of 818 years and 205 days verified by Guinness World Records on June 1st. The eldest of the siblings, who have become local legends in their village of Perdasdefogu, is Consolata, who turns 105 years tomorrow. Consolata is followed by 99-year-old Claudina, who was seen Sunday in the front row at morning Mass in the local church of St. Peter. Next is Maria (not pictured), at 97; Antonio at 93; Concetta aged 91; followed by 89-year-old Adolfo who still works in a local bar. Other siblings include Vitalio, 81, Fida, 80, and finally the baby of the bunch, 78-year-old Mafalda, who lives in Cagliari with Vitalio.